Cleaning your home or office is no more a hard task when you own a Dyson Upright Vacuum Cleaner. These vacuum cleaners are engineered with more suction power and greater flexibility for optimum cleaning performance. Also, thanks to their instant release wand you can clean your walls and under the furniture without any hassle. The filtration system of any Dyson Upright Vacuum Cleaner plays a vital role in proper functioning of the vacuum cleaner. It consists of 2 filters, called pre filter and post filter. The pre filter acts as a protection to the cyclone system. If this filter gets too congested, the vacuum cleaner will not run properly and could damage interior components. Also, the post filter is located after the motor and traps the fine particles before the air is expelled back out into the room. Over time, these filters can deteriorate and need to be replaced. But if you choose Dyson OEM Filters they will cost you more. Don't worry! The solution is here! 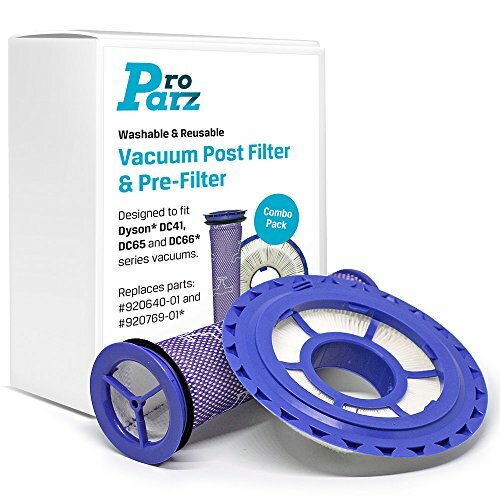 Introducing PRE AND POST HEPA AIR FILTER REPLACEMENT KIT FOR DYSON! Our filter replacements replace parts 920769-01 and 920640-01 and compatible with following Dyson Upright Vacuum Cleaners. DC41 Animal, DC41 Animal Complete, DC41 Animal Complete Exclusive, DC41 Animal Exclusive, DC41 Animal Plus, DC41 Multi Floor, DC41 Total Clean, DC65 Animal, DC65 Animal Complete, DC65 Animal Complete Exclusive, DC65 Animal Exclusive, DC65 Animal Total Clean, DC65 Multi Floor, Dyson Ball Allergy, Dyson Ball Allergy Exclusive and Dyson Ball Exclusive. This is not a Dyson OEM product. The Dyson brand names and logos are the registered trademarks of their respective owners. Any use of the Dyson brand names or model designations for this product are made solely for purposes of demonstrating compatibility. GUARANTEED SATISFACTION OR YOUR MONEY BACK. We have made a complete commitment in making you happy with your purchase. But, in a rare case if you aren't "5-STARS HAPPY" simply let us know and enjoy 100% cash back. No questions. No small letters. BROAD COMPATIBILITY. Designed to fit for DC41 Animal, DC41 Animal Complete, DC41 Animal Complete Exclusive, DC41 Animal Exclusive, DC41 Animal Plus, DC41 Multi Floor, DC41 Total Clean, DC65 Animal, DC65 Animal Complete, DC65 Animal Complete Exclusive, DC65 Animal Exclusive, DC65 Animal Total Clean, DC65 Multi Floor, DC66 Animal, Dyson Ball Allergy, Dyson Ball Allergy Exclusive and Dyson Ball Exclusive. INCLUDES A FREE BONUS E-BOOK. Get an exclusive look into our new E-Book ''Some Important Cleaning Habits'' and keep a cleaner, healthier home with a few simple tips. The E-Book will be attached in a follow-up e-mail. If you have opted out e-mails from sellers, you can contact us and we will get back to you with your free E-Book. KEEP YOUR DYSON VACUUM HEALTHY AND ACTIVE. These affordable Dyson post filter and pre filter helps you to get the suction power back of your loving Dyson Upright Vacuum Cleaners. Replaces Parts # 920769-01 and 920640-01. WASHABLE AND REUSABLE. It is important to wash these reusable filters regularly to maintain their performance. Dyson recommends washing your filters every 3 months to extend the life of your filters. Let the filters dry at least 24 hours after rinsing, but if you order 2 sets, you don't have to wait. If you have any questions about this product by ProParz, contact us by completing and submitting the form below. If you are looking for a specif part number, please include it with your message.